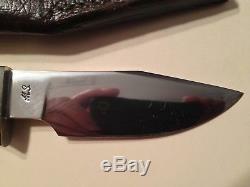 Offered for sale is a E. JAY HENDRICKSON Custom Handmade Clip Point Hunter Fixed Blade Knife. Jay Hendrickson, Master Bladesmith (East Berlin, PA, USA). 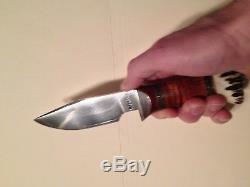 Model: Drop Point Hunter Fixed Blade Knife. Blade: 4.5 D2 stainless steel in a clip point profile. 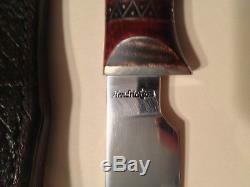 Blade is stamped "HENDRICKSON" on the front and M. (Master Bladesmith designation) on the reverse. 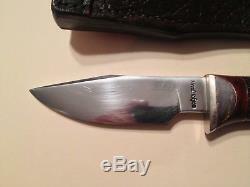 Handle: Steel or nickel silver bolster/guard. Tiger Maple (aka Curly Maple) handle with multiple areas/sections of silver wire inlay. Tang nut at end of handle. OAL: 8.625 including tang nut. Sheath: Heavy brown leather hand made and hand-tooled pouch sheath with belt loop. Clean blade lines married to. 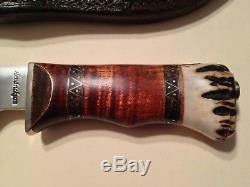 An awesome handle create a beautiful knife by a top tier Master Bladesmith. Fit and finish is unbelievable. 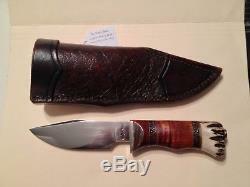 Perfectly designed and sized hunter, skinner or EDC. Jay Hendrickson was born and raised in Susquehanna, PA, Jay spent many of his days as a youth hunting and fishing the endless mountain region of Pennsylvania. It was at this time that he developed his love of knives and handcrafted bows and arrows. In 1974 he seriously started making knives, while pursuing a career in telecommunications at IBM. Jay became a full time knifemaker in 1987 and received his Masters Certification in 1989. Jay was one of the ABS members instrumental in the planning and formulation of the W. Moran School of Bladesmithing in Washington, Arkansas and the Bladesmith Museum in Little Rock, Arkansas. He has been teaching the basic bladesmithing course at the school since its beginning. Prior to this, Jay taught ABS classes at the Rochester Institute of Technology in Rochester, NY for five years. Jay has made knives for people in many countries but one of the highlights of his knifemaking career was to forge Kukri Knives for King Hussein of Jordan. Last year, Jay celebrated his 25th year in knifemaking. He prides himself on making knives the traditional way, doing everything by hand and eye coordination, using minimal machinery. Jay's knives have been featured on the covers of. Jay makes all styles of straight knives. 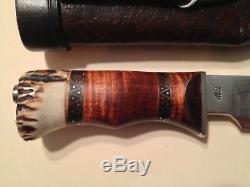 He makes his own Damascus, does all of the handle treatments, and creates and hand sews his own sheaths. American Bladesmith Society Master Bladesmith. Knifemakers Guild Voting Member since 1993. Beretta Award for Outstanding Achievement in Handcrafted Cutlery. ABS, Don Hastings Award for exceptional service towards the continued preservation of the forged blade. 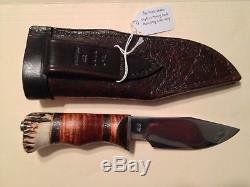 Jay specializes in Hunters, Bowies, Camp Knives, Daggers & Special Customer orders. Knives are hand forged using 5160, 52100, L6, D2, W2, etc. Most work includes fine silver inlay combined with other escutcheons of silver, ivory, turquoise, etc. Handles are almost always natural wood & antler materials. I have not used, carried, sheathed or sharpened this knife. It has been displayed, and held by me a few times, but is in otherwise "excellent to like new" condition. The blade looks to be in excellent condition with a couple of minor spots and some fine lines/scratches unsure if this is from original grinding, prior sheathing or prior use? 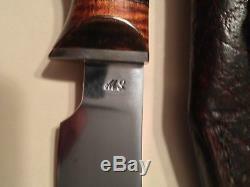 The knife appears to have the original maker edge. 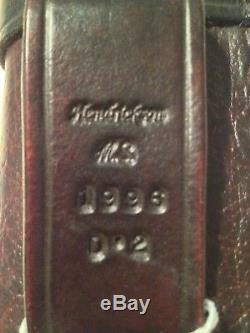 The handle is in excellent condition. Wonderful grain to the maple. Stunning silver wire inlay work. 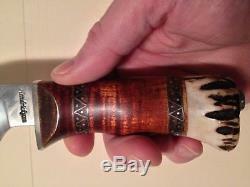 The sheath also looks to be in excellent condition with minor to moderate storage wear. Owned and displayed by an adult collector in a smoke free home. Please check out my other auctions for a selection of comics, graphic novels, trade paperbacks, books, toys, video games, CDs, comic book, comic strip and illustration art, knives, and other collectibles. The item "JAY HENDRICKSON Clip Point Hunting Knife Tiger Maple Silver Inlay Leather Sheath" is in sale since Monday, January 22, 2018. This item is in the category "Collectibles\Knives, Swords & Blades\Collectible Fixed Blade Knives\Modern Fixed Blade\Custom & Handmade". 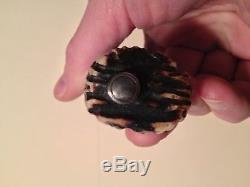 The seller is "rfcarlinii" and is located in Kings Park, New York. This item can be shipped to United States.